I am sure that many of you have now heard the perils of Negative Amortization Loans. I have done a little research and found that Negative Amortization Loans are still being offered by US mortgage companies today. One primary rule of business is, “If no one is willing to buy a product, then no company bothers to sell the product.” What does this mean? It means that if companies are still offering Negative Amortization Loans, there are still consumers in the US who are buying these loans. Therefore I felt it was important to talk about how Negative Amortization loans work and how to realize that you are in fact purchasing this type of loan. Payment Option – The monthly payment you chose to make on negative Amortization Loan. Typically this is based on a percent of the principal (like 1% of the principal). The payment option does not affect the interest rate of the loan. In a typical 30 year Fixed Rate Mortgage, the loan has a 30 year amortization period. If you bought a $250,000 home, the original principal would be $250,000. The loan is amortized over 30 years, which means at the end of the 30 years you will have paid off the original $250,000 and your house will be paid off (assuming you did not refinance). If you originally owed the bank $250,000, after 1 year of payments you would still owe $246,311.59. In comparison, a Negative Amortization loan does not pay off the original $250,000 that you borrowed from the bank. Instead the principal balance increases every month. In this example, you owe 5% in interest charges every year, but you are only making 1% interest payments. Therefore at the end of 1 year you would owe the bank $252,917.06. Notice, this is $2,917.06 more than the original loan. Why is a Negative Amortization Loan the easiest way to end up in foreclosure? I have just showed you that the balance owed on these loans increases every month. Unless your house value consistently increases, you eventually owe more to the bank than your house is worth. If you owe more than your house is worth, you cannot refinance the loan or sell the house. This means, if you cannot make the loan payments, typically, your only option is to foreclose. Many people do not understand how Negative Amortization Loans work, and therefore do not understand how they could end up unable to make the payments. It is important to note that the interest rate on Negative Amortization loans is not fixed. Since the interest rate is adjustable, you could start out with a 5% interest rate and end up with an 8% interest rate a year later. In addition, the minimum payment on a Negative Amortization Loan also adjusts throughout time. Although many borrowers start out paying 1%, the payments eventually change to interest only or principal payments. When this happens the monthly payment on your loan can double. Let’s think about our earlier example. Originally you were making a 1% payment on a 5% loan. Your monthly payment would have been $804.10. Now let’s assume that your interest rate increases to 8% and you are now forced to pay at least the interest payment. Your new payment is $1,666.67. 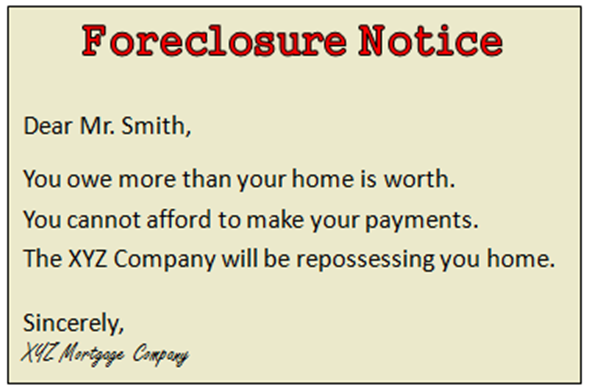 If you cannot afford to pay $1666.67 and you now owe more than the house is worth, the bank forecloses on your home. If Negative Amortization Loans are so risky, why do people choose them? If you have been following this blog, you probably know that I used to be a Personal Banker. At the time I lived in Stockton, CA. Stockton was one of the cities that were hit hardest by sub-prime lending. Although the bank I worked for did not offer Negative Amortization Loans, I know many people who had Negative Amortization Loans on their house. Almost all of them were forced into foreclosure. The most common reason a consumer chooses a Negative Amortization Loan is because they do not realize what they are getting into. Many people are totally unaware that the principal balance they owe to the mortgage company is increasing every month. They become aware of the issue when they go into an unrelated bank and try to make a monthly mortgage payment and the teller or banker notices an extremely low payment amount for the size of the loan. How could someone chose a Negative Amortization loan without realizing how it works? Risky products are never marketed as something that may kill you. Think of prescription diet pills. They are marketed as helping people drop 50 lbs in 2 months, not as something that has a 30% chance of giving you a heart arrhythmia. Negative amortization loans are sold in the same fashion. Companies talk about low monthly payments so you can afford a home and ability to refinance later when the value of the home increases or you start making more money. “The loan has a 1% payment.” Home loans in the US never have 1% interest rates. If someone ever tells you 1%, they are either putting you in a Negative Amortization Loan or the interest rate on the loan will increase dramatically after the first year or two. 3. The monthly payment is much lower than any other quote you have gotten. Usually a couple hundred dollars or more lower. 4. You did not think you could afford this house until you talked to your realtor or mortgage broker. 5. You have a bad or ‘not so great’ credit score and someone is offering you really low interest on a mortgage. What can you do if you are worried someone might be putting you in a Negative Amortization Loan, but you are not sure? Before you sign, bring a copy of the documents to another bank. Ask the banker to look at the closing documents and tell you what type of loan it is. It is essential that the bank has no relation to your mortgage broker or your realtor. If you are uncomfortable bringing the documents to another bank, have a lawyer look at them. If nothing else, chose a friend or family member who is well versed in finances and have them look at the documents. Have you had experience with a Negative Amortization Loan? Are looking for help to get out you Negative Amortization Loan? Do you have other related questions? I would love to hear from you. Please feel free to leave a comment.